Couldn’t resist showing you this–I was doing a loaf bread on the outdoor covered gas grill, right on the grates (indirect heat), flipping at midpoint, for about 30 minutes total baking with both burners on low. I figured that since it was being done on “low,” maybe I could skip the slashing. For loaf breads, always slash a half-inch deep with a serrated bread knife, or your loaf may give birth to a little guy like this. The exception? For breads done in a loaf pan–the pan prevents the really unpredictable results; you can usually skip the slash. Another thing that can help–a longer resting time, like 90 minutes. In free-form breads, the slash lets oven spring expand and crack the loaf in a controlled way! I’m working with the master recipe in Healthy Bread in Five Minutes a Day. When I mix my dough and let it rest, it doesn’t come out stretchy at all. I don’t need scissors it just kind of separates itself. How do I get my dough stretchy? Make it wetter? Michelle: What’s the final baked result? Is it dry and tough? If so, I wonder if you’re using a very coarse-ground product like Hodgson Mills or Bobs Red Mill. Some people find those too dry (absorb a lot of water). Consider trying a batch with something like Gold Medal Whole Wheat, or other mass-market supermarket flour– they’re ground finer. And of course continue to use vital wheat gluten, can’t do without that. On the other hand, if you like the baked result, don’t do anything– it’s just a difference in the way raw whole grain dough feels, compared to white. Karen: Depends, what kind of dough was it (from which book, what page number)? My dough was the basic white recipe. It does have sour dough in the mix. I like to put a cup and a half of sourdough when I mix up the basic recipe. Karen: not a problem so long as no eggs. Check out the Tips and Techniques chapter in the book as well. It’s so nice again to ask and get an answer right away. Thankyou! Good point, didn’t think of that before. I have a quick ? I just bought all my ingredients to make you master recipes, I am so excited. But I cant find a 5uqt bucket anywhere. Can I use a big stock pot instead? silly ? but I thought I’d ask. Yes, the pot’s lid is a good non-airtight cover. I don’t have a 5qt bucket either. Here’s what I do. I have a tall rectangle rubbermade container. I line it with a 2qt zip lock bag and fold it over the edges. I don’t use the zip lock. I mix my dough in my KA mixer and dump it in the bag. It rises on the counter than I just place the lid on the container and dont seal it up. then it lives in my fridge overnight. I can dump out the contents of the bag onto a big piece of parchment or a floured board and using a floured knife I cut it in to 4 pieces. I have 4 pieces of preped parchment to put my loaves on. Then I ready my oven. I have two pizza stones and I bake 4 loaves at a time. One gets eaten up right away! the other lasts about two days. I freeze two loaves after they cool completely. I wrap them in press n seal. I let them thaw out overnight on a board with a linen cloth on them so they are ready for breakfast toast. This way I only heat up the oven once a week! oh…and I reuse the 2 qt bag a few times cause they still has a little bit of dough on the sides….that just makes it better. And I don’t worry about mixing dough from one kind of bread with another. It’s all good. I am so frustrated, I ordered almost every piece of equipment listed on left column, have all 3 books, have read and researched them from cover from cover. Followed instructions to Nth degree…use a KA mixer, red star yeast, gold medal A/P un-bleached flour, Morton kosher salt, spring water…ck’d temp of water, room when resting, oven temp, use stone, time resting…you name it … My crust is hard enough to almost break a window, crumb is soggy and little rise…my family wants soft crust, large holes and shiny cumb. I’ve read the trouble shooting tips in book 2, am soo disappointed I want to cry… On my 3rd batch of dough…have tried the whole wheat master and the original….plz tell me what (if you can) I’m doing wrong, we want soft crust French bread and to be able to stop buying Walmart deli brand…. AngelWB: Soft-crusted breads aren’t what you get with the basic artisanal method, which is designed to create a crackly crust. For a soft crust, you need to either use one of the enriched doughs, or paint the surface with oil or butter before baking. But the soggy crumb and minimal rise is more worrisome. Are you measuring by scoop and sweep? Does the dough seem too wet to shape? Other measuring methods may give you less flour per cup, resulting in a too-wet dough that doesn’t rise well. Once we get your dough consistency right, you’ll see shiny crumb, but much more so with longer-aged dough, and especially if there’s some rye in the mix. Angel: Not sure if the GM weights will coincide with ours, see http://artisanbreadinfive.com/2008/02/10/qa-flour-and-water and scroll down for weight equivalents. More weight equivalents in the 2nd book you have. You can’t switch the temp like that– measure the temp in the oven with something like http://ow.ly/8CVPU. At 350, that loaf you tried will never brown, and the crust will just gradually dry out and become like a rock. You always need steam with lean dough (see 2nd book for steam alternatives if your oven isn’t trapping steam well (sounds like it isn’t). If the dough’s still cold and clammy–must rest longer, 90 min or more. Understand that our standard recipe designed to give you a crisp crust, which many people aren’t used to. I think you’re going to prefer something enriched. Buttermilk bread, challah, brioche are enriched, see what you think. Angel: 205 to 210 for the non-egg, non-sweetened breads. About 180 to 185 for Challah and Brioche (enriched doughs)– the eggs burn at high temp, sugars/honey too. Those thermometers are tricky to use– have to be confident you’re in the center of the loaf. Angel: Never checked internal temp @ that stage, the thermometer is going to stick to the dough. If it’s lost its clammy cold feeling, it’s good. Doesn’t absolutely have to be at that stage though. Thank you thank you thank you!!! I’ve made four of the gf artisan boules and they get better and better. I love it and my husband thought it was delicious! 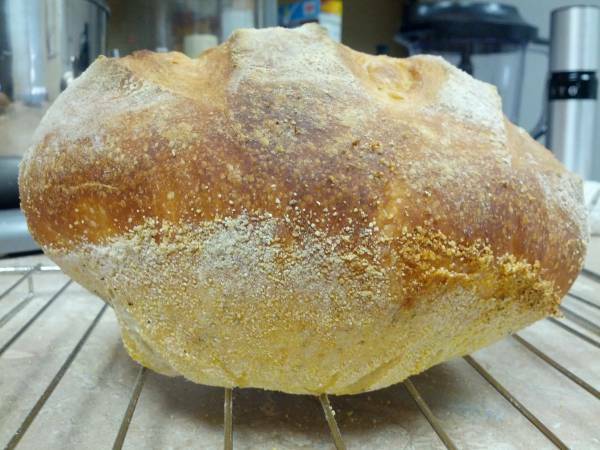 I always enjoyed making bread and now I still can.I let the dough rest and baked it in a dutch oven. I’m very thankful to have found your recipe. Take care. Thank you for the lovely note, we are thrilled that you are enjoying the g-f bread! Hey all…dough not done? slice it up and toast it! undone dough make GREAT toast! Hi, I have a question about flour. I’ve been making the master recipe and getting raves from family and friends (and making lots of referrals! ), and since I’m making it more often, I’ve been through two 25lb bags of flour and now even bought a 50lb bag; to keep it from growing worms I freeze it for a couple days, but then the flour gets little raisin-sized lumps, which remain in the dough and result in little lumpy nodules in the bread. I tried pounding through my measured flour with a whisk to break up lumps, but that still didn’t help. I know the master recipe says “unsifted” flour, but does that just to ensure the correct measurement? If I sifted the flour after I measured it out, would that be bad for the bread? If you measure the flour first and then sift it, it will do no damage to the bread, just make more work. When I slash my risen bread just prior to placing in the oven, the dough falls. Is this normal or am I suppose to let rise a bit after slashing? Sheila: Yes, a little, so long as the final baked result isn’t dense, this is fine. No need to rest after slashing. So, I made my bread, and while it looks beautiful, the bottom expanded instead of the top. Any idea why? It’s bizarre, and I can’t figure it out! 1. Longer resting time, 60, or even 90 minutes in a cooler kitchen. Sounds to me like the dough may have dried out a little during your proof time before baking. If the surface of the dough dries out then it cannot rise properly in the baking. The dough will bloom towards the area that still has moisture (the bottom was protected from drying out by the surface it sat on). The different coloration on the bottom of the loaf, and the “ashy” look of the top lead me to believe that the surface dried out. You can get a spray bottle (dedicated to having only water in it) and mist the surface of the dough thoroughly before it proofs and this should not happen. I wouldn’t try deeper scores, as you could cause the dough to de-gas. As the yeast eats the sugars in the dough, it gives off gas which causes the loaf to rise. If the surface has dried out the gasses will be trapped inside (some escape if the surface allows it, which is ideal). By making deeper scores you could cut into pockets of said gasses and let them out quickly causing the dough to fall, or crater. Excessive handling of proofed dough that has a dry surface can also cause it to de-gas, this is what happens to dough that you allow to rise, then punch down and knead and allow a second rise. Great if that’s what you want to have happen, not so if not. Hi RubeRad. I freeze my flour too before storing in the cupboard. You need to put the flour packet into an air-tight sealed container (intact plastic bag with a firm knot in the top will do). When you take it out of the freezer, leave it on the bench to come up to room temperature before you unseal the container and store the flour. This prevents excessive condensation from wetting the flour. I forgot to slash my loaf!?!?? I was doing week in a day cooking, which included 5/day bread,. I started my day early Sunday with making the master recipe. I let it rise on the counter 2+ hours & put in the fridge for nearly 4 hours. Shaped my loaf, let it rest while preheating & prepping other stuff. I was still a couple hours out from dinner knowing I needed to let it cool. In the midst of prepping other things, when the timer went off on my rest I ran the water good & hot, got a cupful, put the loaf on the stone, water in the pan, closed up, set the timer, & went onto the next. About 5 minutes in I had breather, checked my loaf, marveled at the wonderful oven spring, until I realized there were no slashes. OH CRAP! I grabbed the knife, floured it with what was still on the counter & tried to slash. I had to poke with the knifepoint get it started, even though it is a large good serrated bread knife. I managed a VERY shallow, small +. I closed up the oven/loaf, decided doing it better would lose too much heat. Loaf turned out, just OK. crust was fine, it split to one side;shape was more oval than when it went in the oven; crumb wasn’t bad, but not as good as usual. Not as bad as it could have been, but still frustrated me. What’s better, slashing part way through baking or just letting it go & dealing with an odd/deformed loaf? Sounds like slashing partway through didn’t help, which doesn’t surprise me. If the crust has started to set, it probably makes no difference at that point–it’s not going to help. Now I am looking for a good looking and great tasting loaf. When I slash, or try to, the dough is too soft and the blade just mushes around. Should I add more flour when I cloak. I am using scoop and sweep, but maybe too gently. Have you watched any of our videos? It is the best way to really see how we recommend slashing. The key is to use a very sharp knife and moving quickly through the dough can help prevent it from grabbing the dough as you pull it through. As I was checking to see how my loaves were doing in the oven, I realized I’d forgotten to slash. I’ve been making your bread for at least four years now and still love it. How satisfying to find you had already answered this question. Thank you for all you do to keep us happy bakers. By the way, having gotten pretty comfortable with this kind of bread making, I am now baking breads the conventional way, too. Thank you for the lovely note, we are so happy that you are enjoying all the bread! Bread Basket for 4th of July Picnic!